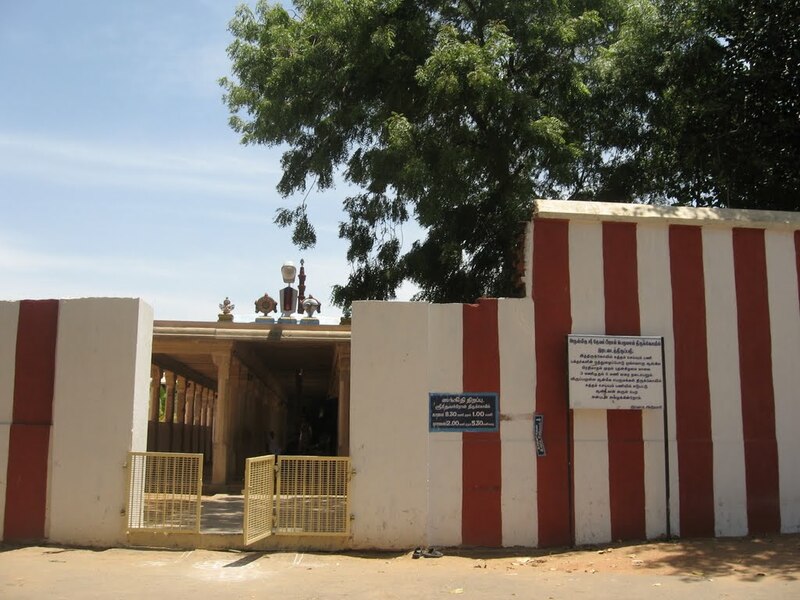 A saint by name ‘Athreya Suprabhar’ came to this place for performing a ‘Yaga‘. While cleaning the place, he found a shining Villu (bow) and a Tharasu (weighing balance). When he touched them, the Villu became a man and the Tharasu a woman. Both told that they were under a curse by Kubera and that they got their Vimochanam (release) when the saint touched. 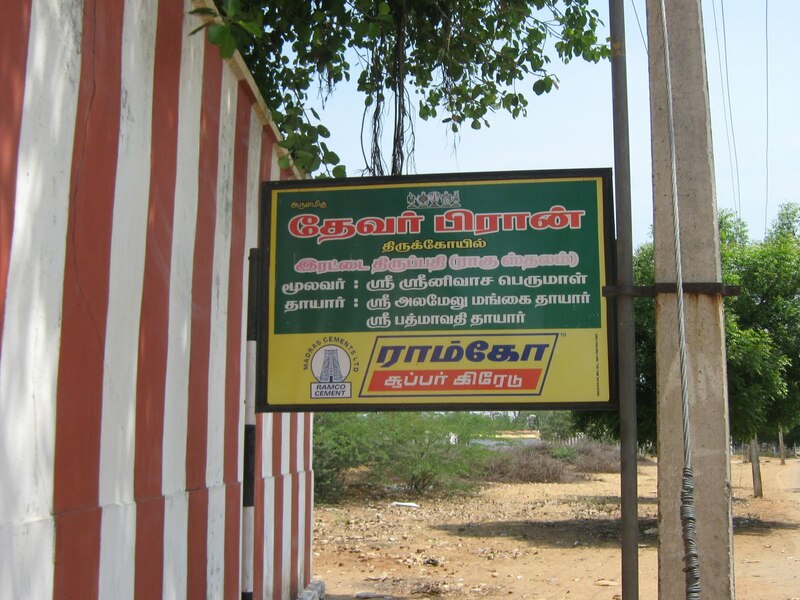 This place thus got the name Thiru ‘Thulai’ ‘Villi’ Mangalam. 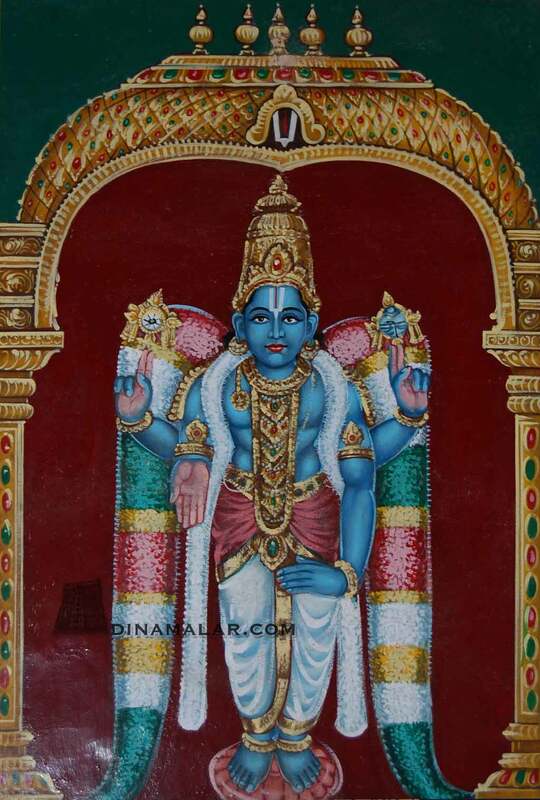 The prefix Thiru denotes respect to God. Saint Suprabhar finished his Yaga and shared with the ‘Deva’s the Havirbagam he got from the it. They jointly offered prayers to Lord Vishnu, who, pleased by that, appeared in person and blessed them. 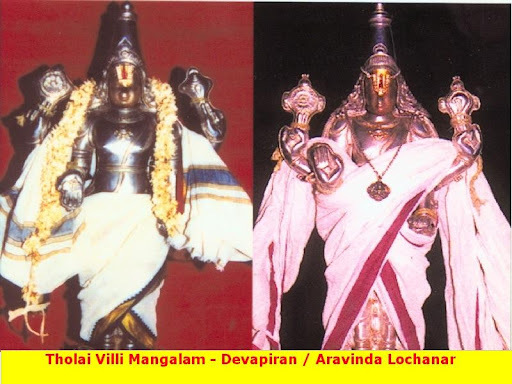 Hence Maha Vishnu came to be known as ‘Deva Piran‘ here and this place became His holy abode. 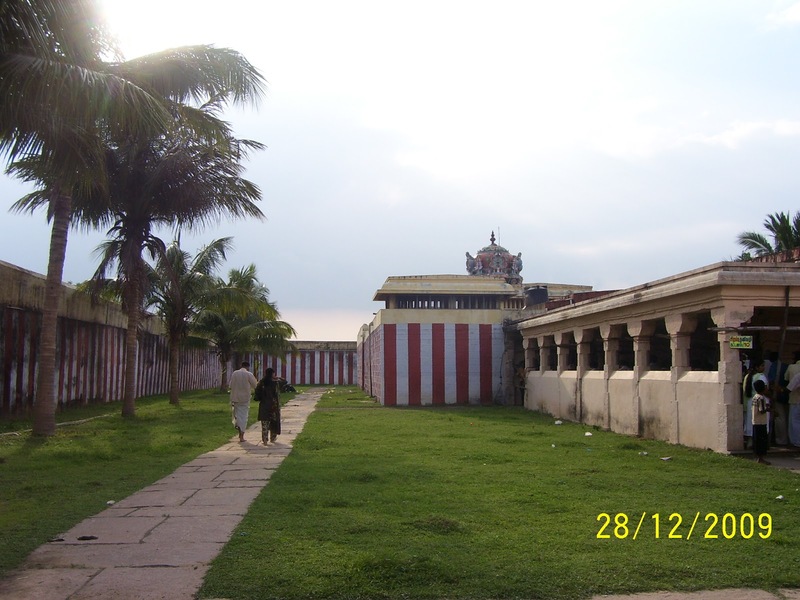 The Lord is said to have given darshan to Indira, Varuna and Vayu here. 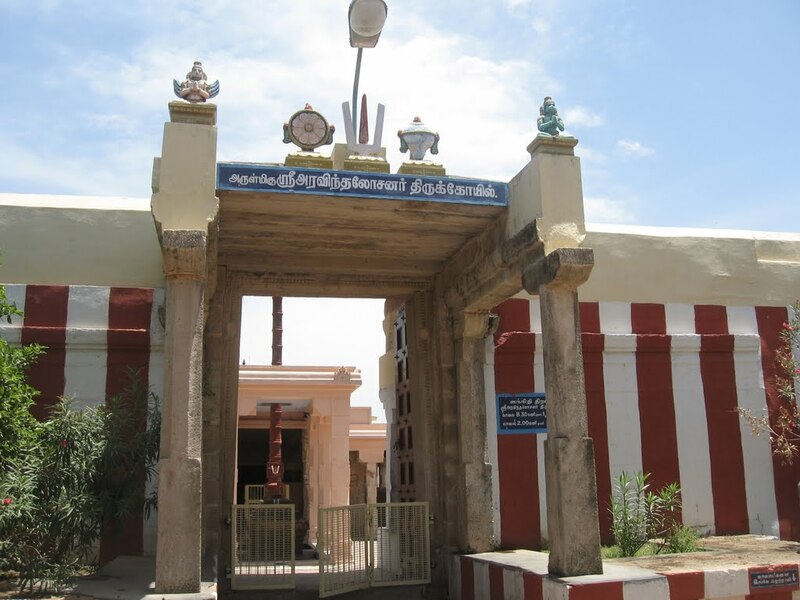 The temple is open from 08:30 a.m. to 01:00 p.m. and from 02:00 p.m. to 05:30 p.m.
Tirutholaivillimangalam is about 39 kms from Tirunelveli. Of the sacred places dedicated to the planets, this is the one most difficult to reach. We have to go to Mangalakurichi which is about 2 kms. 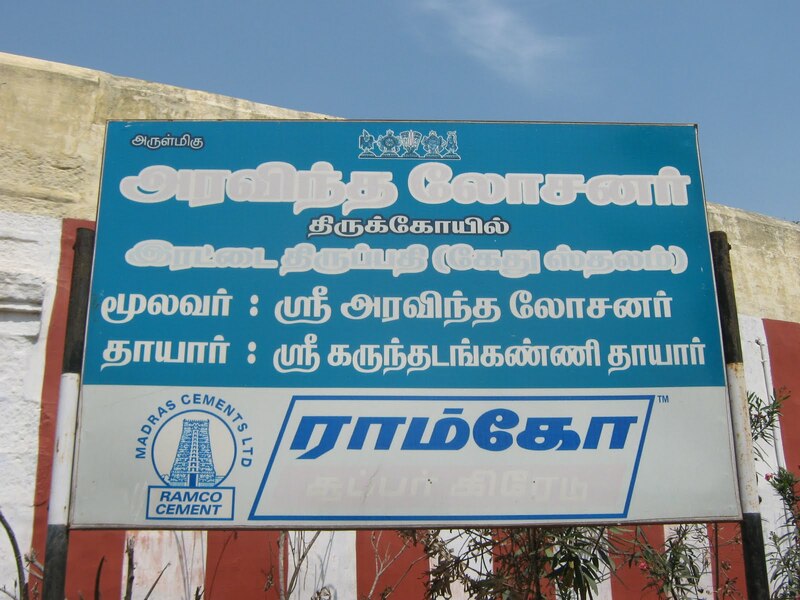 from Perungulam, walk on the canal bank for about 3 kms., cross the canal and reach the place or walk about 3 kms. from Alwar Thirunagari and crossing river Thamiraparani, we can reach this village. Adequate bus-services are avilable from Tirunelveli/ Tiruchendur. Contact : Seshamani Bhattar @ 94424 90567 ; S.Raghu Bhattar @ 94878 31689. 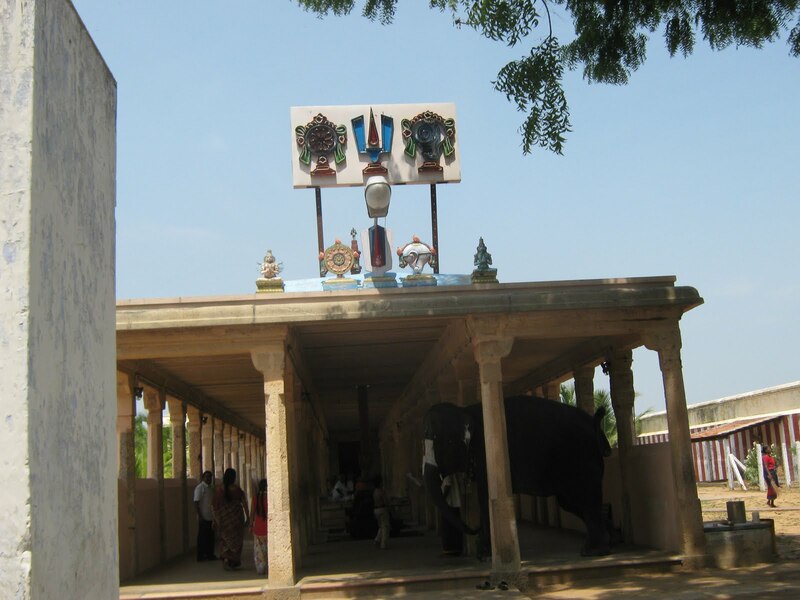 100 yards North of Devapiran temple is the Aravinda Losanar temple. Pleased with Sage Suprabar’s devotion of offering Lotus flowers every day without fail., Lord provided darshan in a standing posture. As he adorned himself with the Lotus flowers, he is referred to as Aravinda Losanar. Belief is that those who offer sincere prayers here with Lotus flowers will be relieved from their sins. After finishing his Yaga at ‘Devar Piran’s sannidhi, Suprabhar used to bring fresh Lotus flowers every day from a nearby lake and offer them to ‘Devar Piran’. It is said that Lord Vishnu came out of his sanctum and walked a little towards north to find out from where Suprabhar got the flowers. Surprised by the Lord’s act, Suprabhar wanted to know the reason for it. 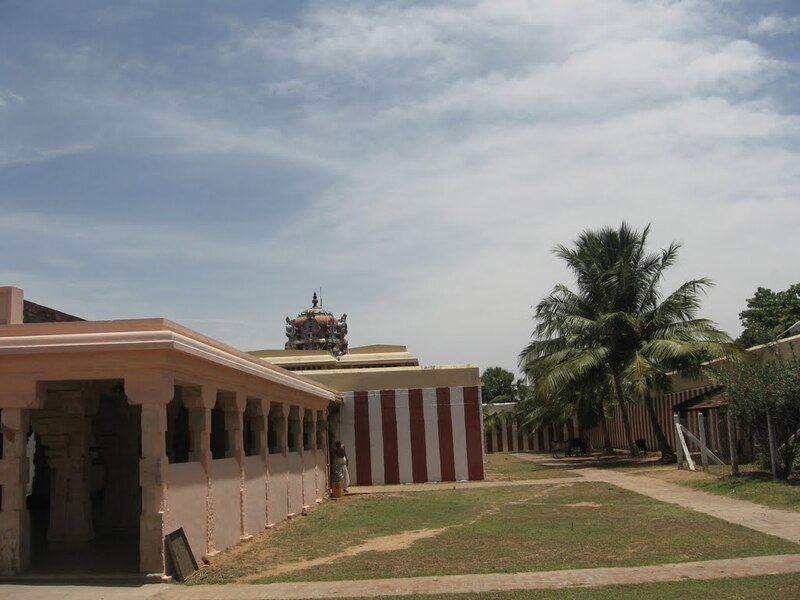 The Lord told that He was very much pleased with the way Suprabhar worshipped ‘Devar Piran’ with fresh Lotus flowers and wanted the later to perform Abhishekam and Archana for Him also at the northern spot where he stood. Suprabhar did likewise every day. Thus the Northern Temple came into existence. The Lord assured that anyone who worshipped Him there with Lotus flowers would be freed from all sins and blessed. Aswini Devas, the originators of Medical science, worshipped the Lord like that and reaped the benefit. A leprosy patient by name Vipeethakanis said to have got completely cured by bathing in the templeTeertham here and worshipping the Lord. The temple is open from 09:00 a.m. to 01:00 p.m. and from 02:00 p.m. to 06:00 p.m. Contact : Ramanan Bhattar @ 94435 54570.